Luggage trailers are a great solution for carrying around your possessions. They are easily fitted to most bikes, relatively inexpensive and some can fold flat when not in use. Who needs a luggage trailer? Anyone who regularly carries around a lot of luggage. 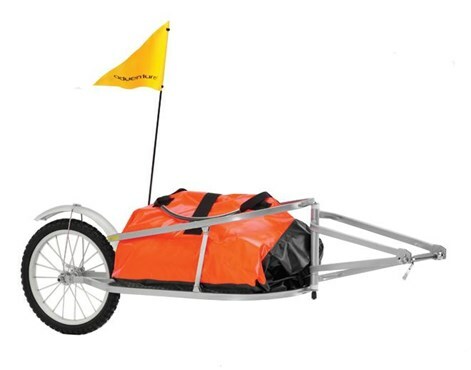 They can take the weight off the bike itself, rather than using panniers and other bags. 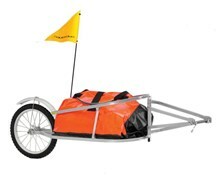 Use one for your commute, deliveries or adventuring. Child trailers are a separate entity! There are a variety of makes and models available, but be careful to choose one that is compatible with your bike. Look for waterproof, durable and sturdy covers to keep everything safe and dry. Waterproofing can diminish over time, so a waterproofer is always a good investment. Tools for fixing the trailer can be bought from our tool section, if you don’t already have some. Be prepared that the trailer might not be visibile to traffic at roundabouts, so take a good hearty swing out to the left so traffic from the right can see your additional load. Carry out trailer maintenance and cleaning frequently – you don’t want to arrive at your destination to find your trailer has said an unexpected farewell.